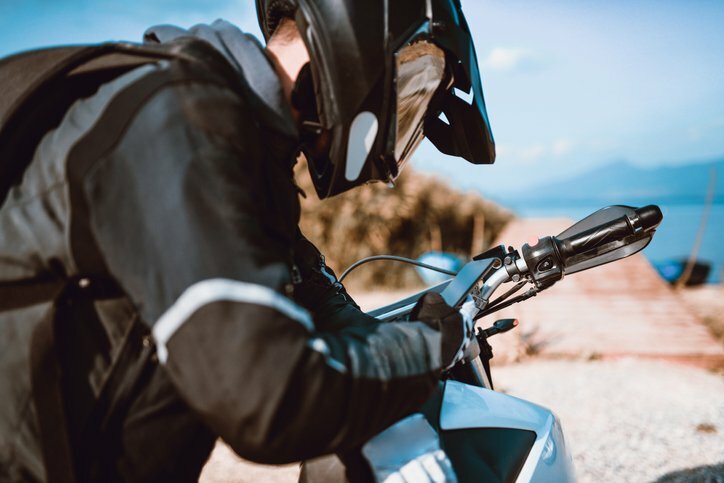 Getting a motorcycle license in the U.S. is relatively easy compared to some other countries, but requirements for a motorcycle license differ slightly from one state to another. Start by checking with the Department of Motor Vehicles in your state to find out the specific requirements where you live. You do not have to own a motorcycle to get a license for operating one, but you do need experience and training to pass the DMV motorcycle license test. The best place for getting this training is by attending a motorcycle safety program course. Some states, including California, require completion of a safety course for motorcycle drivers under age 21. Many states have more than one kind of motorcycle license. In California, an M1 permit allows you to ride any motorcycle or motorized scooter. The M2 license is issued for mopeds, motorized bicycles, and motor scooters only. Be sure to submit an application for the type of motorcycle vehicle you plan to operate. No matter what age you are, if you want to get a motorcycle license, you must first start by getting a learner’s permit. If you are under age 21, you must have a learner’s permit for a minimum of six months before you can apply for the full license. To get a learner’s permit in most cases, you must be at least 15 ½ years old and have a regular state drivers license or proof that you have completed both a driver’s education and driver’s training course. Once you have a learner’s permit, you are allowed to drive a motorcycle during the daytime. However, you cannot operate on the freeway or carry passengers while you have a learner’s permit. In most states, there are separate requirements for a regular motorcycle license for people under 21 years old and those over 21. Applicants under 21 must be at least 16 years old, driving with a motorcycle learner’s permit for at least 6 months before applying for a full motorcycle driving license. You also must have proof of successful completion of a state-approved motorcycle driving training program when you apply. If you are over 21 and have not taken a motorcycle training course, you will also be required to pass a motorcycle driving skills test. In California, the cost for a motorcycle drivers license is $35.